Sarah had just completed her high school and was pretty relaxed and comfortable sitting in her favorite corner at home. She was happy to ponder at the thought of “no more school for me. ” So saying she picked up one of the magazines on the table and flipped the pages. She always had an interest in fashionable clothes, and suddenly she said to herself – hey why not I learn more about what I love most. And that’s when her curiosity in fashion was kindled. So for all the Sarahs who love good clothes, let us take a look into the basics of Pattern Drafting as that is where it all begins…. The development of a garment comprises of different processes. Fit is the most important factor leading to the final acceptance or rejection of a garment. Fit must be designed into the original pattern through subtleties in the pattern that provide fullness unobtrusively at appropriate locations to accommodate body bulges in a flattering manner (Hudson). Good customized fit is dependent on the pattern drafting incorporating various shapes and proportions of the individual customer. Pattern making is the art of manipulating and shaping a flat piece of fabric to conform to one or more curves of the human figure . It is a bridge function between design and production. A sketch can be turned into a garment via a pattern which interprets the design in the form of the garment components (Cooklin). A pattern is flat while the body is not. The body has height, width and depth. With in this roughly cylindrical framework there are a series of secondary curves and bulges, which are of concern to the pattern maker. Darts are the basis of all pattern making. They convert the flat piece of cloth into a three dimensional form, which fits the bulges of the body. 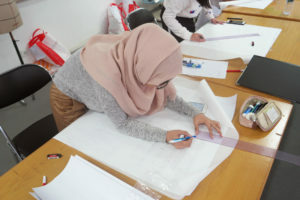 A pattern maker typically makes a pattern from a flat sketch with measurements or a two dimensional fashion illustration. Involves measurements derived from sizing systems or accurate measurements taken on a person, dress or body form. 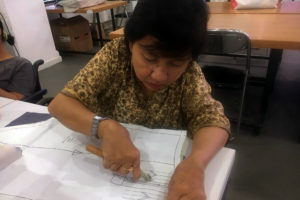 Measurements for chest, waist, hip and so on, and ease allowances are marked on paper and construction lines are drawn to complete the pattern. Drafting is used to create basic, foundation or design patterns. Involves the draping of a two dimensional piece of fabric around a form, conforming to its shape, creating a three-dimensional fabric pattern. 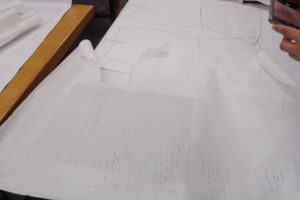 This muslin is transferred to paper to be used as a final pattern (Armstrong). Ease allowances for movement are added to make the garment comfortable to wear. Advantage of draping is that the designer can see the overall design effect of the finished garment on the body form before the garment piece is cut and sewn. However, it is more expensive and time consuming than flat pattern making. Involves the development of a fitted basic pattern with comfort ease to fit a person or body form. A sloper is the starting point for flat pattern designing. It is a simple pattern that fits the body with just enough ease for movement and comfort (Shoben and Ward). Five basic pattern pieces are used for womens clothing. They include a snug-fitting bodice front and bodice back with darts and a basic neckline, a sleeve and a fitted skirt front and back with darts. However, as fashion changes frequently womens styles fluctuate frequently. These basic slopers are then manipulated to create fashions. Professional pattern makers are employed by apparel companies and work closely with design teams. 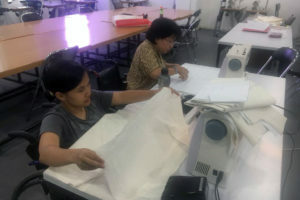 Depending on the employer, pattern makers may be required to execute the design from 1st pattern through production. 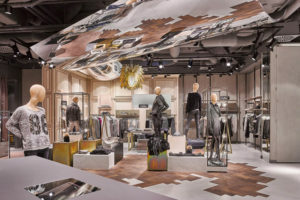 Comprehension of fabric properties, the ability to execute corrections, manage fittings, and knowledge of Photoshop and Illustrator are some of the qualifications sought after by the industry. Sarah having gone through the above, gave it a serious thought and surprisingly showed up at Esmod Jakarta and enrolled as a student of Fashion Design and Creation in the Three Year Program.